Selma’s opening gambit is David Oyelowo, masquerading uncannily as Martin Luther King, reciting a rousing speech in the mirror, but it’s not anything to do with having a dream, its King’s 1964 acceptance speech for the Nobel Peace Prize. 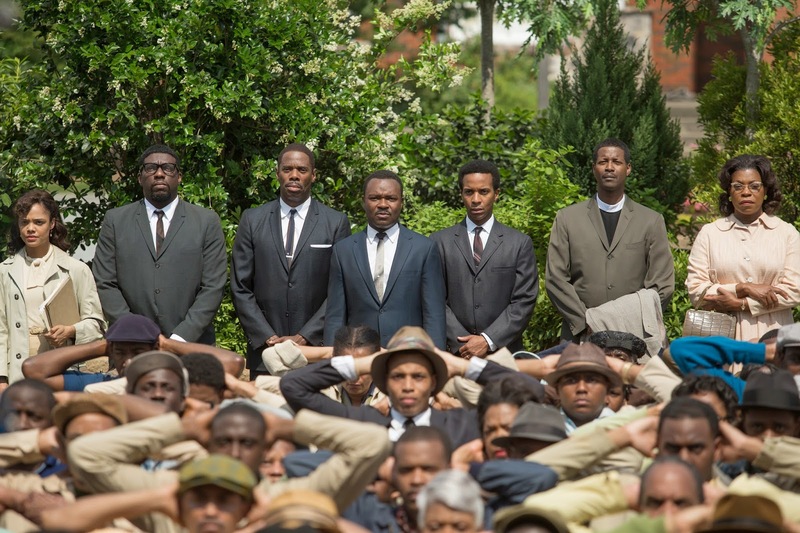 Rather than stomp over well-trodden turf regarding King’s legacy, Selma marches into new territories with a confident, defiant, albeit familiar and Oscar eyeing, air that sees cinema, once again, successfully combine biopic with historical drama. In recent years the historical biopic has become a commercial and critical winner. We’ve seen The Iron Lady, J. Edgar, Mandela: Long Walk to Freedom, The Butler Dallas Buyers Club, The King’s Speech, 12 Years a Slave, Lincoln, and The Help all delve into the popular format, with the latter five all picking up Oscars in some capacity. With these successes in mind, and the growing cinematic conscience for black history, notably the tribulations associated with race, it shouldn’t really be a surprise to see Selma on our screens, surfacing conspicuously close to the Oscars. It seems long overdue that someone as politically, culturally and historically impactful as Martin Luther King gets their own film, yet rather than attempt to portray a complete biography of King’s life, Selma focuses on one significant moment in his, and America’s, history- the 1965 Selma to Montgomery black voting rights march. In a similar vein to Lincoln, a film whose influence looms large over Selma at all times, battle lines are drawn early in order to lay the founding struggle to lead the narrative. On the one side are King (David Oyelowo) and the Southern Christian Leadership Conference (SCLC) battling to afford basic rights to black Americans; on the other are the hick, racist barbarians of the Southern States led by the charmingly vile Governor of Alabama, George Wallace (Tim Roth). In the middle of it all, tussling with both sides, is newly appointed President Lyndon B. Johnson (Tom Wilkinson). Relative newcomer David Oyelowo announces himself on the world stage by impressively and powerfully tackling the daunting role of Dr Martin Luther King Jr. Oyelowo’s voice, with its perfectly enunciated Southern drawl, bellows throughout the film’s many rousing, impassioned speeches. King’s powers of oration are captured with gusto and might not only by Oyelowo’s sermon-like delivery, but also by Bradford Young’s cinematography as he consistently utilises close ups to draw all the attention to this charismatic presence. 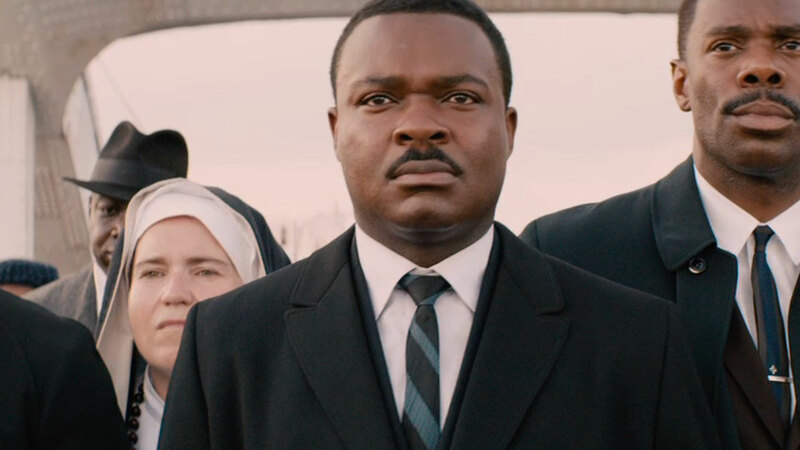 Selma, aided to no end by Oyelowo’s performance, projects King as the inspirational figurehead of the civil rights movement we all know of, although it doesn’t rest on this infallible image. The film touches on, if only briefly, King’s extramarital affairs and the personal cost to his family, and himself, of his anointment as a leading political activist for black Americans. It’s refreshing to see that Ava DuVernay has the guts to pry into the darker side of King’s legacy, something that recent biopics like The Theory of Everything and Lincoln shied away from. 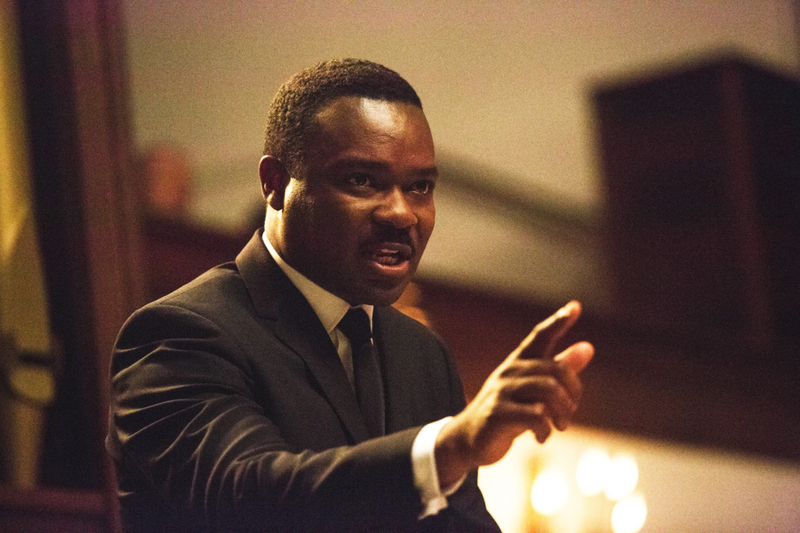 Beyond Oyelowo’s attention grabbing performance, Selma is a very polished piece of filmmaking, which is to say that DuVernay relies largely on proven techniques. When King mounts the podium to speak of racial injustice the soaring music roars behind him to inspire the audience. Similarly, when the obligatory police brutality rears its ugly redneck face the film adopts a Peckinpah-esq bout of slow motion, combined with a SnorriCam, to make every baton blow thunder into our guts. There’s little wrong with Selma’s safe approach, but it fails to really ignite the imagination and rouse the emotions beyond when you’re prompted. Occasionally there are moments of innovative direction that elevate the film beyond a fairly solid historical biopic. At one point we see King and President Johnson passionately debating the future of the civil rights movement while a portrait of George Washington hangs judgingly between them. The beauty of the scene is in the ambiguity of where Washington’s sentiments would lie; King’s belief in equality, or Johnson’s belief in pragmatism? It’s a clever nod to the not so black and white nature of the political warhead. Another memorable, inventive scene depicts a murderous explosion in a church through a dreamy haze of colour, limbs and debris as if we were floating through space rather than something as grounded and horrific as a bomb detonating. These moments of creative thinking are merely outposts in the otherwise conservative landscape of Selma. 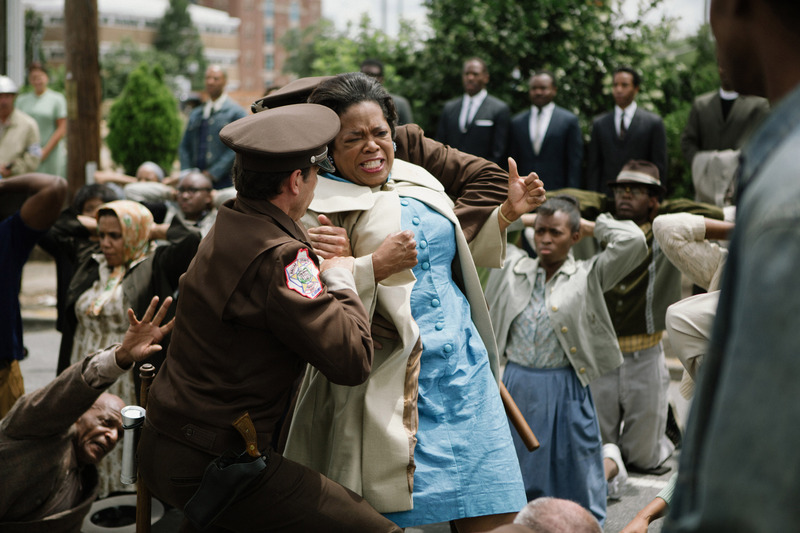 Throughout Selma it feels like DuVernay, as a black American, is trying desperately hard to rein in her own bias perspective on the film’s events. The attempts to portray a balanced view of the complexities involved in the civil rights movement wilts in the final third. Johnson is shown up to be a less than noble man, the Southern people are all stereotyped as bloody thirsty bigots and an epilogue condemns a majority of those who weren’t in favour of the black vote with a snide vindictiveness. It all just lapses into a simple good/bad dynamic that predictably see’s King the inspirational vanquisher of oppressive white men’s rules. Irrelevant of the historical facts, Selma waves its agenda a little too forcefully in audiences’ faces to leave any room for personal interpretations. Selma ticks all the boxes you’d expect for an historical biopic- rousing, inspirational, insightful and anchored by an enigmatic central performance-but the genre itself is growing tediously safe by lapsing into a unsubtle strategy to nab an Oscar. The ensemble of famous faces associated with Selma, such as Martin Sheen, Cuba Gooding Jr and Brad Pitt, only adds to the feeling that DuVernay and co have made a film to fit an award winning template rather than the other way round. You could attribute Selma’s Oscar admission to the fact we’ve had so many historical biopics of late to dull the senses, but the fact The Theory of Everything and The Imitation Game have been nominated does make Selma and Oyelowo’s absence rather perplexing. The tag of ‘Oscar bait’ doesn’t stop Selma from being an enjoyable, accomplished film even if it does at times feel like a dynamic, dialogue heavy history lesson. David Oyelowo’s refreshing turn as King is worth a watch alone, but for a real dose of gripping cinema centred on American race relations in the 1960s it’s best to revisit the likes of Mississippi Burning, To Kill a Mocking Bird, In the Heat of the Night and Guess Who’s Coming to Dinner.